“Trick or treat, smell my feet; give me something good to eat.” So goes the juvenile poem that children recite on Halloween to an explosion of tiny smirks and barely concealed snickers from their disguised friends. But this Halloween, Conestoga Students Inc. hopes that Conestoga College students take it literally and try to get something actually good and healthy for their fellow students to eat. CSI’s Fright Night for Food campaign aims to collect food for the CSI Food Bank, which is run right out of the college for students – many whom are international students. “It pretty much works on the premise that instead of trick or treating for lollies and candies, etc., you trick or treat for canned goods or non-perishable items,” said Trish Crompton, CSI director of external relations and mastermind behind the campaign. If the fact that she used the word “lollies” didn’t tip you off to the fact that Trish is an international student, her Australian accent certainly would. As such, she faces many of the same problems as other international students, such as paying three times the tuition that Canadians pay and having zero access to OSAP. But at least Crompton has access to food and connections in the area, as her dad lives here. Many international students in Canada are alone and hungry. Despite the efforts of the CSI Food Bank, which is run by CSI director of community outreach, Taryn Schmidt, the demand simply exceeds the supply. 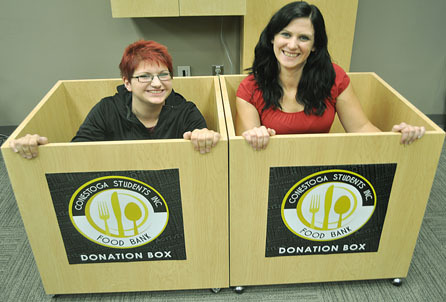 “We are seeing a huge increase in the amount of students utilizing the food bank now. I would say nine out of 10 students are international students,” said Schmidt. She also noted that using the food bank isn’t a permanent solution to a problem more rooted in lack of jobs and support for international students than simply a lack of food. Although the campaign is similar to Free the Children’s Halloween for Hunger, Crompton wants to keep this effort local to the college. Schmidt agreed with the sentiment. This wouldn’t be the first time that students banded together to help the food bank. Schmidt said recently the second-year marketing students collected $100 and some food for them through a fundraiser. She said the protection, security and investigation program collected over 90 kilograms for the food bank earlier in the semester.